The end of the joint Kate/KDevelop Sprint 2015 is coming closer, half of the people already have left to get home. I came to the sprint to work on getting our bugs sorted and fixed and to improve the state of the Mac port. I must confess, the bug fixing session worked out well, but I didn’t take a shot at Mac at all. What did I achieve? I fixed many small bugs and I reintroduced the automatic brackets completion removed by accident in the KDE 4.x => KF5 transition. In addition I cleaned up old things in our bugzilla. The new policy for Kate will be: wishes that not got any attention since 2 years will be closed, it makes no sense to keep them around for ever and it will only make overview about what is really wanted impossible. In addition, I tried to help Kåre Särs to get Kate running on Windows. 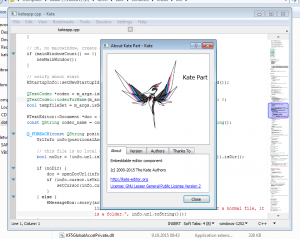 We want to have a way to build Kate with a unpatched Qt. At the moment that is not really feasible, as things like ui files are not found, xml syntax files are not found and so on. I started to solve that issues and at least KTextEditor framework itself should now be more or less Windows (and therefore Mac) compatible. But the other frameworks will still need love, like KXmlGui not being able to locate its own ui_standards.rc. 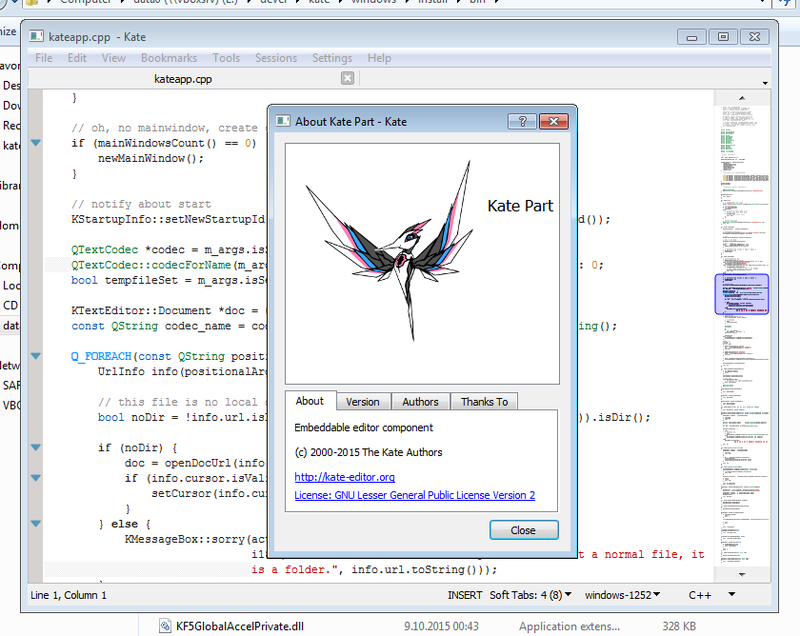 Kate application is now compilable without any strange patches, too, on Windows. All in all, I think it was a productive sprint. Not that we all reached our goals, but we did make progress. P.S. Yeah, sponsoring implies that the e.V. has money for that. To keep such spring sponsoring possible in the future => give us money!